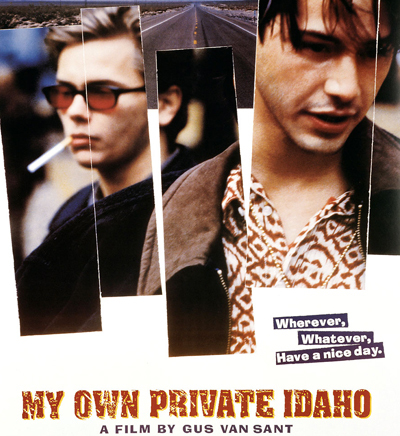 Gus van Sant's visually and emotionally powerful road movie My Own Private Idaho was one of a group of films from the early 1990s known as New Queer Cinema, all of which were independent films with gay themes (arguably the first being Poison by Todd Haynes). The potentially controversial subject-matter (young male hustlers) was offset by the unexpected casting: teen idols River Phoenix and Keanu Reeves, both of whom were risking their mainstream appeal by starring in the film. The narcoleptic central character, played by Phoenix (who, of course, would die of a drugs overdose two years later), first appears on an empty highway. It feels like the build-up to the crop-dusting sequence from North By Northwest. We return to this road at the end of the film, when Phoenix is bundled into a car by an unseen driver. This was originally intended as a happy ending, with the driver's identity revealed, though van Sant ultimately filmed the sequence in long-shot to maintain ambiguity. To me, the ending has echoes of the tragic conclusion to Easy Rider. A Clockwork Orange is another key reference, with similar scenes of young gang-members using intentionally unidiomatic dialogue. The brightly-coloured credits and inter-titles are an homage to Kubrick's film, though the (incongruous) Shakespearean dialogue was apparently inspired by Chimes At Midnight (which is namechecked, as is Rio Bravo) and the film is a loose adaptation of Shakespeare's Henry IV. Gus van Sant has also directed the black comedy To Die For and an oddly anachronistic Psycho remake. Several of his films, including My Own Private Idaho, take place in Portland, Oregon though he is now most famous for Good Will Hunting which, like The Departed, stars Matt Damon and is set in Boston. Keanu Reeves and River Phoenix had previously appeared together in I Love You To Death. Reeves later appeared in superior blockbusters such as Speed, Devil's Advocate, and The Matrix, though his more recent films (The Lake House and a remake of The Day The Earth Stood Still) have been much less successful. Poison = a New Queer Cinema?! Really! I've a DVD of this film, but not seen it yet. I brought one because It's Todd Haynes's film and I love Julianne Moore. Anyway,I thought the story might be about a pollution or something. Yes! It's New Queer Cinema na.